Arquipa will take your breath away, and it is not just because of the rarefied air. 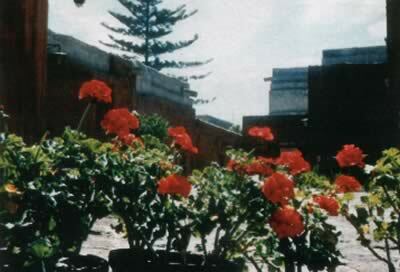 Arequipa is a beautiful city that had worked hard to retain its provincial charm. The relaxed pace of this colonial city high in the Andes is a welcome respite from the hustle and bustle of Lima. In 1549, a Spaniard wrote of the city, "the location and the climate of the city are so good that it is reputed the healthiest and pleasantest place to life." Nearly 450 years have passed and Arequipa is still renowned as one of the few places in the world that boasts a climate "of eternal springtime." Rarely is there a day when the sun does not make an appearance. The (robin's egg) blue of the sky makes the pristine white colonial buildings glow in the sun. In the distance, the snow covered, slumbering volcano, El Misti, pierces the blue sky, making an idea backdrop for any picture. The beauty of Arequipa is unsurpassed. Six hundred miles south of Lima, Arequipa, at an elevation of nearly 8,000 feet, is an oasis in one of the driest parts of the world. Nestled in the valley of the Chili River, on the Pan American highway, the city is watched over by three volcanoes - Misti, Chachani, and Pichu Pichu. The snow white peaks contrast beautifully with the brilliant blue sun dilled sky. Because of the volcanoes, the area is rich in ashlar, a soft volcanic rock, that was used in the construction of the colonial buildings. 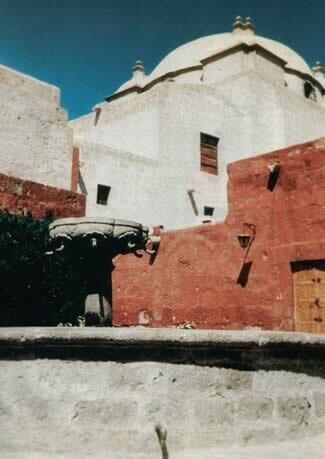 The white building material is the reason that Arequipa is called the "White City". The city has made a conscious effort to retain its colonial charm by restoring its colonial buildings. Buildings that reflect the colonial architecture are used to house shops, offices and banks. 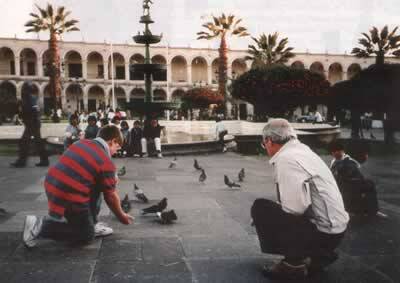 It is easy to fall into the relaxed pace of life of Arequipa. Sit on one of the benches in the main plaza, Plaza de Armas, and watch the many life scenes played out daily in the park. On one bench a man with a typewriter in his lap taps out correspondence for people. A small girl with big brown eyes and rosy cheeks hides shyly behind her mother's bright red skirts as her mother offers articles made of alpaca wool for sale. The haunting melody of the Andean pipes played by a quartet is interrupted by laughter from those on the other side of the park who are amused by an actor performing mime. The scene is constantly changing and reveals the many aspects of Arequipean life. The cathedral with its twin towers dominated the plaza. It was rebuilt in the 1800's after it was damaged by an earthquake. Often a procession of the faithful exits the church and makes its way through the streets. The most impressive church is just a step away from the plaza. La Campania, a Jesuit church, took 45 years to build. It is remarkable for the intricate ashlar carvings around the entrances, and the altars of carved wood covered with gold leaf. 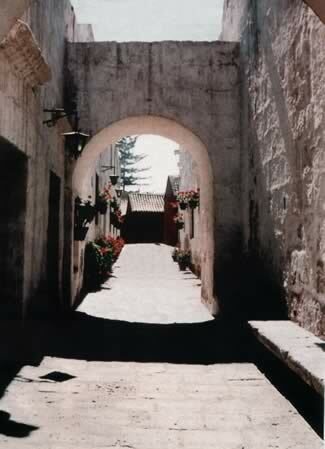 The pearl of Arequipa is the convent of Santa Catalina. As you walk along the paths of the convent listen carefully. It's the soft murmuring of prayers that you hear... or is it the gentle breeze? The past seems hauntingly close. As you wander down a narrow walkway, or sit in one of the courtyards surrounded by buildings of pink and coral, or admire the bright red flowers silhouetted against the azure skies, you will feel wrapped in the solitude and peace that welcomed so many women. The convent became their life forever. Once they entered their only view of the outside world was El Misti. It was often a refuge for wealthy women who brought their serving maids with them. The convent was founded in 1579 and remained sealed against the world for nearly 400 years. When a new convent was built, the one was restored and opened to the public in 1970. Santa Catalina is really a typical village of the 16th Century. It has houses, streets, cooking area, a bakery, cloisters, a church and the traditional isolated cells all frozen in the 16th Century. About five miles from town is a small recreation area popular with the local people. Besides the small ponds, restaurant and horseback riding, Sabandia has a restors mill that dated from the 18th Century. The mill is in working condition and a popular tourist stop. The alpacas grazing nearby also attract attention. The countryside around Arequipa is beautiful. Terreves built by the Inca and possibly pre-Inca people are still farmed in the traditional manner. The ideal climate and irrigation allows the fertile countryside to be farmed the year around. The melting snows atop the nearby volcanoes provide the much needed irrigation water. No visit to Arequipa is complete without a leisurely meal at a picanteria. A picnateria serves a typical Arequipean-style meal with or without hot sauce. The more adventurous might want to try the local delicacy, cuychactado. The fried pressed guinea pig comes complete with head and feet and is reputed to be quite tasty. 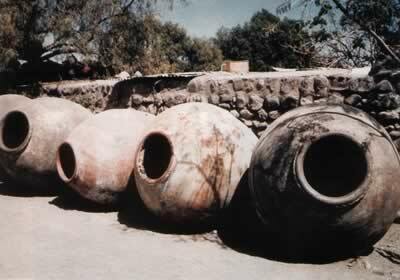 There are several local drinks made from corn-chicha morada and shicha de jora. People who suffer from the effects of sorache, or altitude sickness, might want to try mate de coca. The tea made from the leaves of the coca plant is non-addicting and non-narcotic and reputed to relieve the effects of being at altitude. Sorache can affect anyone, but usually at the elevation of Arequipa most people only notice a little shortness of breath. After a couple of days most adjust; even so, it is best to take it easy the first days. In fact, Arequipa is a good place to become acclimated before going to places at a higher altitude, such as Puno and Lake Titicaca on the altiplano. The Arequipa area offers adventure tourism opportunities from white water boating to bird watching. The nearby Colca Valley, famed for its condors, is a popular destination, but river running is only for the experts. The Colca Canyon at 10,000 feet, is the deepest canyon in the world and is becoming a favorite destination for the adventurous. Although the Arequipa has grown to the second most important city in Peru it still retains its distinctive colonial character and charm. A visit to Arequipa is like a visit to Peru during its colonial period. The beauty and serenity of Arequipa, the White City, will not be quickly forgotten.